HALO is now complete. The project outputs and final report may be found on the Results page. If you have questions on any of the material, please do not hesitate to get in touch! We would be very interested to hear of new research or proposal suggestions. 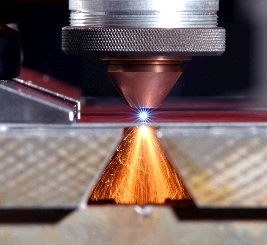 High power lasers are an established industrial tool. They are used to cut, mark, join and pattern metals, ceramics, glasses, semiconductors and plastics. The device you are reading this on was made with the help of such lasers. The HALO project is developing the next generation of these tools. Lasers create a highly intense spot of light when they are shone onto a surface. This spot is naturally most bright in the centre, trailing off rapidly to the edges in a bell-shape of intensity known as a Gaussian distribution. This laser ‘shape’ is not always optimal for some applications. For example, a shape with a darker centre surrounded by a brighter ring, or halo, may create a far neater cut on some materials. Adapting the shape of the beam in real-time, e.g. using components placed in front of the laser, should enable rapid switching between the traditional Gaussian mode and ring-shaped modes or other novel shapes. This means that an application which currently requires more than one type of laser, such as a robot on a car production line cutting rubber and metal, may, in the factory of the future, only require a single laser. The HALO project, which will be delivered by a consortium of European companies, has been set up to exploit this high-value opportunity. It is developing the necessary components to help ensure Europe’s leading role in this technology space. HALO is an FP7 project supported by the European Commission. The project will run from 01-Sep-2012 until 30-Apr-2016. This website has been set up to provide public information on the project, and will be regularly updated throughout the project with news and relevant documents. If you would like to receive an email when a news item is published, please subscribe using the form to the right of this page. For further technical information, please take a look at the Technology section of this site or view this video overview of the project. There are other outputs on the Results page, including a project presentation and newsletters.